One of the first steps to setting up a new online store is entering the store's basic information. This is done in Settings > Store Information > Basic Information. Here, contact information such as email address, mailing address, and phone number are set. This article will walk you through entering this information as well as provide steps for configuring some other important store settings. Alert email addresses receive order notifications and all other store notification emails. By default, the email used to sign-up for the account will be added as an alert email address. Should you need to add to or edit the alert addresses, navigate to Settings > Store Information > Notifications/Alerts. Click the cursor icon to edit an existing address. The Active Countries page is where shipping and billing address countries can be enabled or disabled. 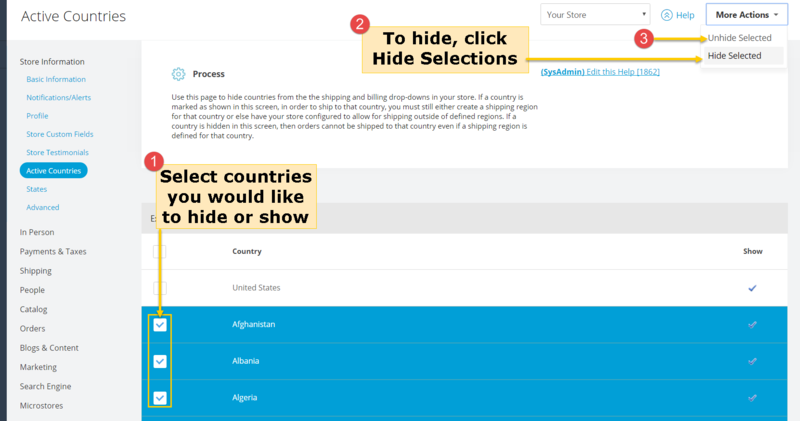 If you only sell to customers in specific countries, disable all other countries to make it easier for the customer to find their country in the address drop-downs. To edit one you've already created click the edit icon. To delete an existing state, click the trash can. Note: Pre-defined states and provinces can not be deleted or edited. The Advanced section of store information is home to various settings. Most notable is the Force HTTPS option. When Force HTTPS is enabled, all pages will be served encrypted and served over HTTPS. By default, only admin pages and pages with customer information are HTTPS pages. For many sites, the Advanced Information Settings are optional.